Mozaby 1.0 has a timeout handler bug. 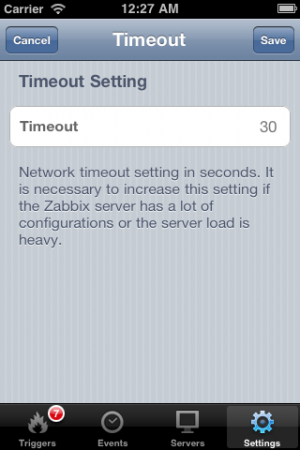 The problem is possibly occurred if the Zabbix server has a lot of configurations or the server load is heavy. Mozaby 1.0 has 30 second timeout to connect Zabbix server. If the loading takes over 30 second, connection timeout error is displayed. In this situation, some information may be broken, or loading indicator may be active endlessly. This bug will be fixed in Mozaby 1.1. User controlable timeout setting screen will be added.